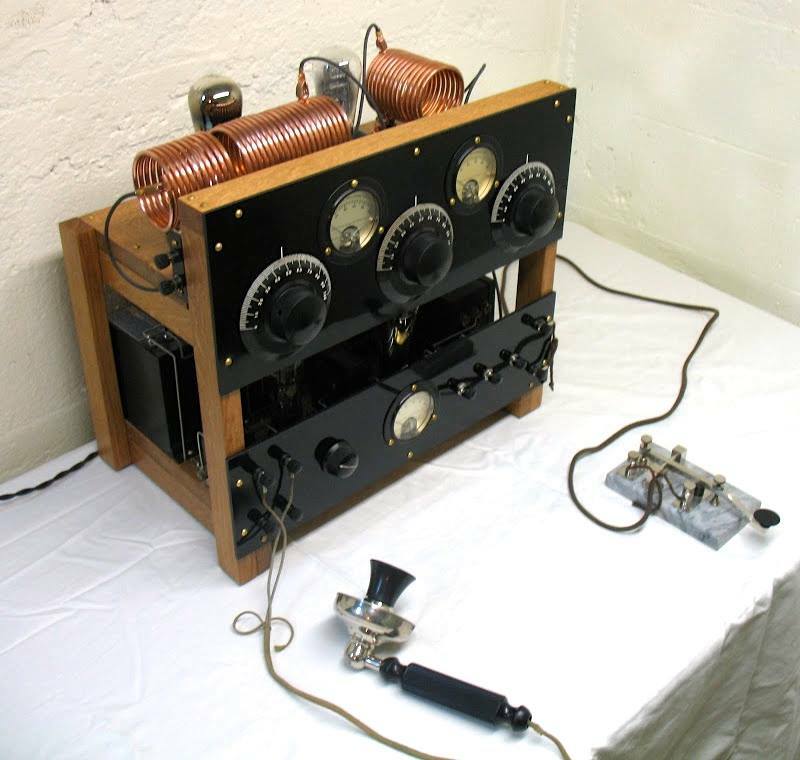 Two Stage Telegraph and Telephone Transmitter built by AB9ZG. Though I’ve experimented a great deal in the field, using amateur radio satellites, as a ARMY MARS operator AAR2AJ, and even played with QRP (low power) gear, my interest tends to the early days of radio the 1920-1930s, what I feel was the golden era. During that time little commercial equipment was available, and most hams simply made their own using off the shelf materials and vacuum tubes, a process known as home brewing. Over the years I’ve restored many of these vintage radio sets, check my Restorations page for more details. One of my antique radio friends built this transmitter some years back, a very true and authentic reproduction. I admired it at the time, not sure I ever worked him with it, but remembered it fondly. Jon, the builder, kindly entrusted it to me as the caretaker, and looks like, given the weekend weather, I’ve finally got time to get it unpacked, tested, fired up, and on the air. Long, cold winter nights in Maine are ideal for radio. I was therefore delighted to be contacted a few weeks by Jon, asking if I had interest in his creation. In any case, wanted to share Jon’s handiwork with my radio, and non-radio friends. Even if you’re not an antique radio fan, you’ve just have to love the time and skill that went into building this rig. The wood, panel work, winding the coils out of copper tubing, the straight and true lines of the bus wiring, entirely handmade, it’s a work of art. It is crystal controlled, you can see the xtal on the right of the upper deck. The upper desk is the RF section, and the lower deck the power supply and modulator. Ideally I’d like to find or build an old table so I can set up a replica 1920/30s station, complete with one of the early National SW-3 receivers. I’ll post more as I get it on the air and operating!